I’m not sure exactly how to say this, so I’m just going to go ahead and put it out there. For the first time in…. ever… I had fun at a baby shower. Real time, legitimate good times at a baby shower. I wasn’t even faking it, not even a little bit. I’m going to stand by what may be an unpopular position. In the past I’ve found most baby showers I’ve had to attend, a troubling combination of boring and humiliating. Between standing around listening to various labor horror stories and playing disgusting baby games that involve Tootsie Rolls and diapers, I typically just barely manage a fake smile. This weekend’s baby shower was different. My friends Mitch and Lara got together, got married, and made another human that Lara is currently growing in her belly. These people are filled with hilarity, and an uncommon and humble goodness. Watching them open their baby gifts with grace and a downright speedy efficiency (thanks! ), I couldn’t help but imagine their little girl filling the onesies, hats and socks they received. While it may sound silly, the reality of this impending life became more lovely and amazing as each gift was opened. That I may or may not have been able to cheat at one of the baby team relay games has very little to do with me having a great time at the shower. Don’t press me on this. Please. Now, without a well-crafted transition, I bring you Crustless But Still Dang Good Quiche. Yes, I think the best part of a slice of quiche is the crust. Yes, I still made this quiche without crust. Sometimes crust, with all of its cutting butter and dusting and rolling pins, seem just a little too daunting for my late morning weekend breakfast. It turns out, if you slather the pie plate with butter, the quiche will bake up beautifully and when sliced, jump out of the dish with no problem. 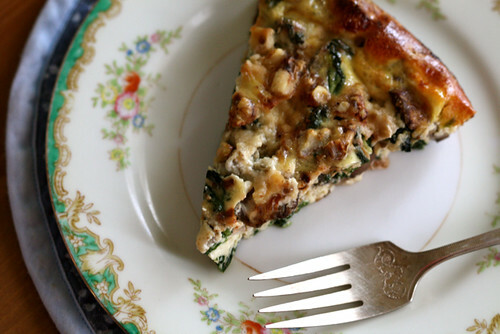 I used a combination of spinach, mushroom, walnuts and blue cheese in this quiche. 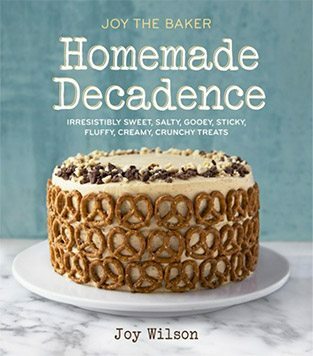 Feel free to play around with any ingredients you might have on hand. Next time I make this, I’m going to stay away from blue cheese. The flavor almost took over the whole quiche. I think a nice cheddar or gruyere would work better. Preheat oven to 375 degrees F. Butter a 9-inch pie dish and set aside. 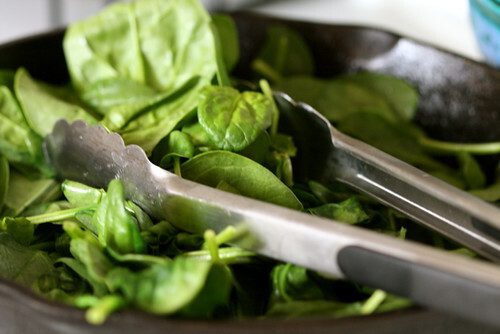 Place the spinach in a large pot, cover and cook over medium heat just until wilted, about 3 minutes. Remove from the heat and spoon into a strainer set over a bowl. Let cool. Press hard on the spinach in the strainer with the back of a spoon to remove most of the moisture, then squeeze in your hands to remove more. Turn out onto a cutting board and coarsely chop Place between two layers of paper towels or wrap in a clean kitchen towel and press to remove more moisture. You should have about 1 cup packed spinach. Set aside. Heat the oil in a large skillet over medium heat. 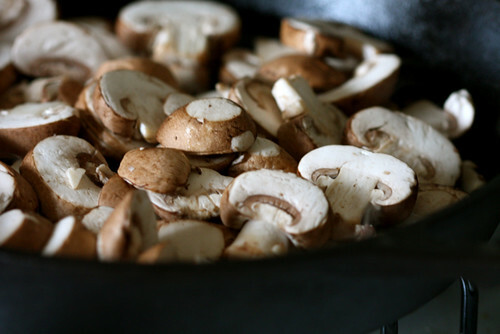 Add the mushrooms and cook, stirring until tender, about 5 minutes. Add the garlic and cook for 1 minutes more. Add the spinach and cook, stirring, until any remaining moisture has evaporated, about 2 minutes. Remove from heat. Add a pinch of salt (the cheese is salty, so you won’t need much) and pepper to taste. In a large bowl, whisk the eggs until light. Stir in the half and half. Spoon the spinach mixture evenly into the buttered pie dish. 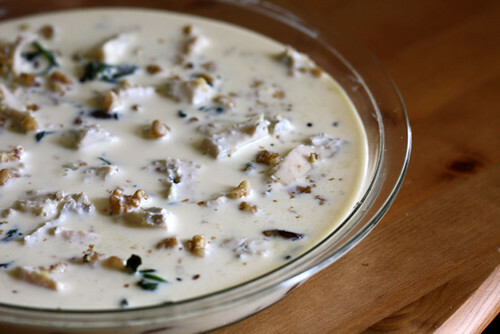 Sprinkle with the cheese and nuts. Pour in the egg mixture. Bake the quiche until puffed and golden brown, about 35 minutes. Serve warm or at room temperature, cut into generous wedges. In our house we call that a frittata. Yum, the combination sounds delish!! 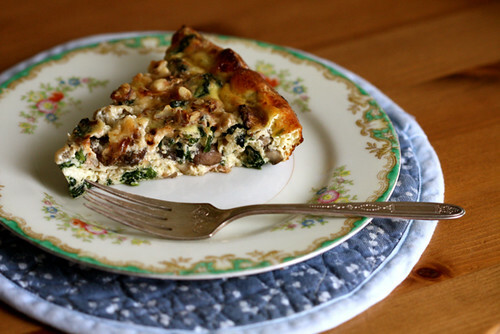 Joy – this quiche looks amazing! Thanks for the recipe. I am hoping to try this for dinner. I’m not usually a fan of quiche. I may have to give this one a try! Crustless quiche! Great idea. I actually have a lot of these ingredients at home right now, and I also have a HUMONGOUS block of feta I got at a wharehouse club for an amazing price of $3.52. I was so amazed at the “deal” I was getting, I didn’t stop to think, “Oh, what am I going to do with all this feta?” I think I’ll make a Spinach Mushroom Walnut Feta Quiche! YUM! thanks for the recipe… this is probably gonna be an easy dinner for me. The blue cheese is a good touch. Yum. A friend of mine once asked me, if I invited you and the other guys to a baby shower, would you come? I hesitated, but finally said, well… If we couldn’t get out of it. They just don’t sound very fun… So she asks, what would make you want to come? I was just kidding and said, make it a baby kegger! She really did it! Obviously she didn’t partake in any keg, and really, it was more a nice barbecue with baby gifts than a kegger, but it was awesome! Crust will never be made in my house. I’m not that motivated, so this looks like something I will actually try! Yeah! This quiche looks divine! 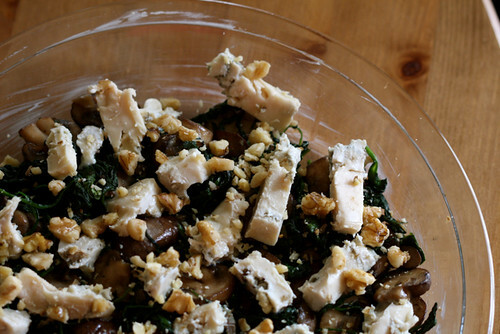 Mushrooms, blue cheese, spinach? I honestly might have to add a little pancetta, but that’s if I’m feeling daring. Thx for the education – I really hated giving up quiche when I found out I had a gluten allergy. Now I don’t have to! I just recently discovered the wonders of a crustless quiche. They are so easy and delicious! I love your combination of mushrooms and blue cheese- yum! Bleu cheese? I’m impressed. Crustless? Always in our house! It’s time to talk about those beautiful plates, Joy. An I love the pattern on the silver fork. Priceless!! !